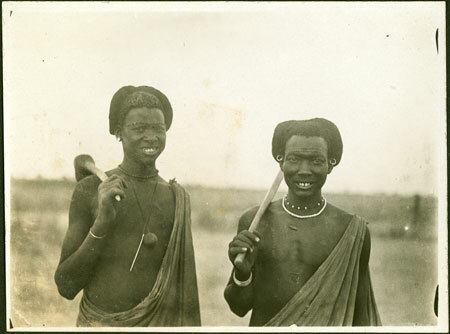 Upper body portraits of two men posed for the camera holding clubs over their shoulders, and wearing neck ornaments. One is wearing a long bone pin on a string along with a small ball ?container. Note on print reverse ms pencil - "SSS overall & RCS 8.89"
Morton, Chris. "Two Shilluk men" Southern Sudan Project (in development). 03 Jan. 2006. Pitt Rivers Museum. <http://southernsudan.prm.ox.ac.uk/details/1998.348.18/>.